(3:55 p.m. EDT) -- Azamara Club Cruises is making it easier for passengers to get the most out of their pre and post-cruise stays on land. Curated local experiences are part of Azamara's new City Stays program, developed in collaboration with Cox & Kings, one of the world's leading luxury tour operators. Available pre- and post-cruise on selected Azamara voyages, the City Stays program includes accommodations for three or more nights, select meals and transfers from the port to the hotel, along with prearranged transfers to the airport. These extended packages are designed to bring the convenience of an Azamara cruise to some of the world's most explorable cities. "The expansion of Azamara's land offerings to include City Stays programs in key markets enhances our guests' connection with the destination by providing opportunities to explore a city from a local's perspective," Larry Pimentel, president & CEO of Azamara Club Cruises, said in a statement. "Now that we have the opportunity to visit more destinations with our new ship, Azamara Pursuit, we will continue to expand our City Stays program across most, if not all, of our turnaround ports, reinforcing Azamara's commitment to destination immersion experiences." 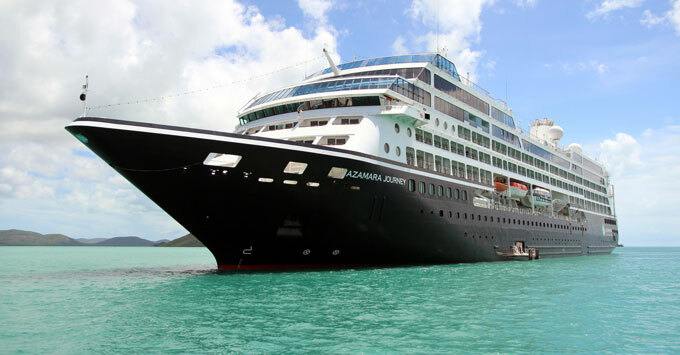 Cox & Kings President Patrick Richards added, "We're thrilled to partner with Azamara on the new City Stays program. We've customized some truly special experiences in some of the world's greatest cities and look forward to showcasing these to Azamara guests." Singapore: Dive into Singapore's renowned culinary culture with a local food critic as a guide. Travelers will set off on a scavenger hunt through the city's cultural sites and enjoy private visits with local artisans, including a fifth-generation baker, a master of making paper houses and a coffee connoisseur. Barcelona: Travelers go beyond the traditional sights of one of Europe's most dynamic cities. Cruisers can expect to visit a fourth-generation candy artisan, stroll through the unique district of Born -- an artistic neighborhood with luxury shopping and museums -- and experience a flamenco performance at night. On a food exploration of the city, visitors will enjoy a meal with a local family while learning about their history or have a gourmet picnic lunch in the park with a Spanish family and join a local wine connoisseur in the evening to try a selection of Spain's best wines, some of which are more than 30 years old. Rome: During this tour of Rome, travelers will explore beyond the traditional sights of this historic city. Journey to an organic farm on the outskirts of Rome, where visitors will learn how to make bread and gnocchi, forage for wild herbs, enjoy a lakefront lunch, visit a milk and cheese laboratory and go on a horseback ride. Following the excursion, participants will receive an exclusive tour of the Vatican Museums and Sistine Chapel -- before public opening hours -- and have dinner at a Michelin-starred restaurant. Azamara's City Stays program is currently offered in Barcelona, Miami, Rome and Venice.